Allison Dewart, attended Towers Elementary, Bert Lynn Middle School and was Captain of her soccer team at West High School in Torrance. In 2006, during her freshman year at Loyola Marymount University, she was killed in an auto accident caused by a drunk driver going the wrong way on the freeway. 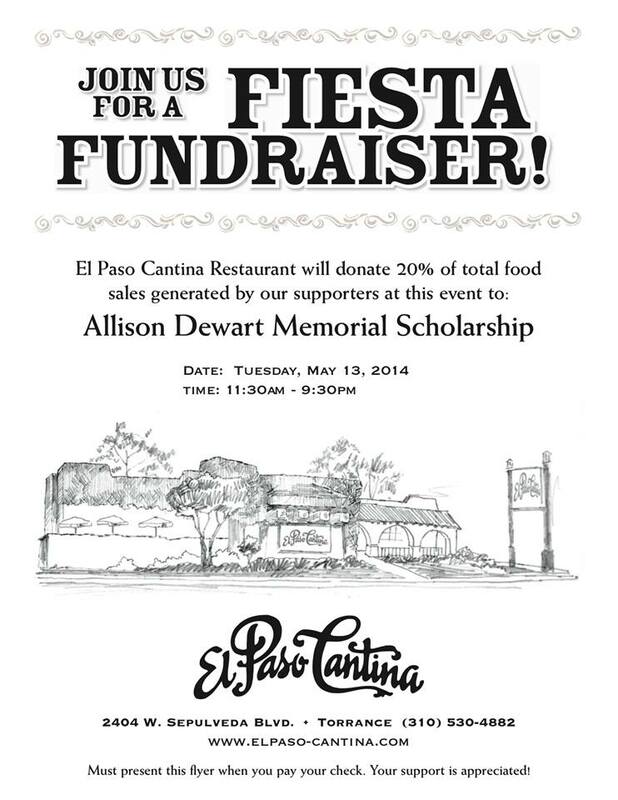 In 2010 Allison’s parents established The Allison Dewart Memorial Scholarship Foundation to award scholarships to female West High School students in her memory. 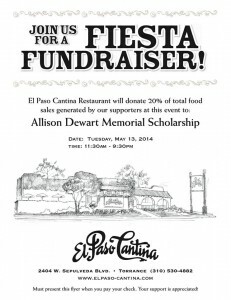 As Allison’s motto was “Mexican food is always good” the Dewarts teamed up with local Mexican restaurant, El Paso Cantina to enhance their fundraising efforts. On Tuesday, May 13, customers that present a copy of the flyer when dining will have 20% of their total food bill donated to the scholarship fund. People wishing to participate in this fundraiser should print out a copy of the flyer, which can be found at https://app.box.com/s/vpuoxumvjer3ligtetas and present it when paying their check. El Paso Cantina is located at 2404 W. Sepulveda Boulevard in Torrance and will be open from 11:30-9:30 PM. More details can be found on the Facebook event page they created.